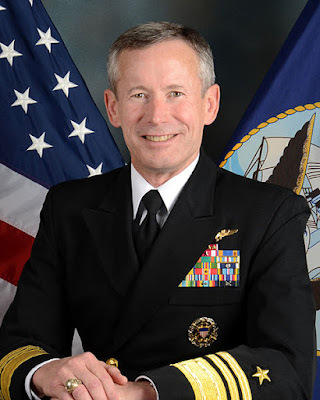 Craig Whitlock at the Washington Post offers a piece the Navy admiral who is in charge of naval intelligence, but can't access classified information due to his possible involvement with a bribery scandal and investigation . Although the Navy transferred Loveless to a slightly less sensitive post, it kept Branch in charge of its intelligence division. That has resulted in an awkward arrangement, akin to sending a warship into battle with its skipper stuck onshore. Some critics have questioned how smart it is for the Navy to retain an intelligence chief with such limitations, for so long, especially at a time when the Pentagon is confronted by crises in the Middle East, the South China Sea, the Korean Peninsula and other hot spots. “I have never heard of anything as asinine, bizarre or stupid in all my years,” Norman Polmar, a naval analyst and historian, said in an interview. Navy Secretary Ray Mabus is a moron. He's a political hack way over his head, and his incompetence is hurting the Navy. This is just one example. I don't know if this was Ray Mabus' call, but, like you, I'm not a fan of the Navy Secretary.